Since capital losses in Tax-Free Savings Accounts (TFSAs) don’t offset capital gains, they become permanent losses. That’s why it’s all the more essential to focus on safety and quality when investing stocks in TFSAs. 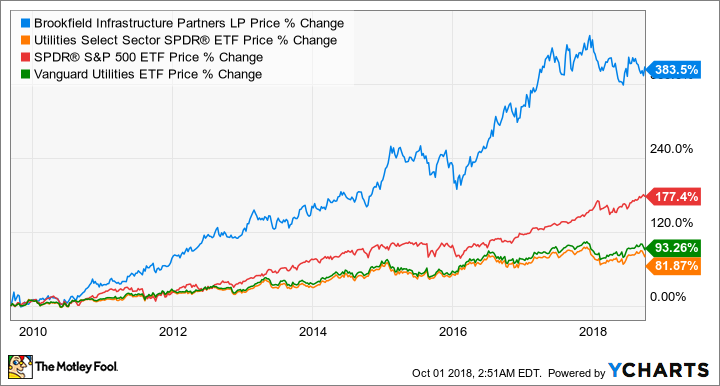 At this part of the cycle with personal and corporate debt at their highest levels in history, investing in dividend stocks, such as Bank of Nova Scotia (TSX:BNS)(NYSE:BNS) and Brookfield Infrastructure Partners (TSX:BIP.UN)(NYSE:BIP) will be defensive. They offer dividend yields that provide above-average income. They’re also defensive businesses. Banks and infrastructure are needed no matter how the economy is doing. So, even when we experience another recession or market crash, both Scotiabank and Brookfield Infrastructure will continue paying their dividends like clockwork. Dividend income offers stable returns no matter what the stock price does. That said, you’ll have a greater chance of boosting your total returns if you buy these stocks when they’re trading at good valuations. Scotiabank stock has pretty much moved in a sideways channel since 2017. Right now, it’s trading at the low end of that range. At about $77 per share as of writing, Canada’s most international bank trades at a blended price-to-earnings (P/E) ratio of 11.1, while its 12-year normal P/E is 12.3. So, the stock is trading at a discount. Based on Scotiabank’s normal P/E of 12.3, it should trade close to roughly $86 per share. Coincidentally or not, the mean 12-month target of Scotiabank from Thomson Reuters analysts is $86.80. So, the stock has +11% near-term upside potential. More importantly, Scotiabank offers a safe 4.4% dividend yield, which is supported by a payout ratio of about 47% this year’s earnings or about 45% on a forward basis. So, you can expect future dividend increases from Scotiabank. The bank has the ability to increase its dividend per share by about 6% per year. Brookfield Infrastructure stock has traded in a sideways channel since mid-2017. Right now, it’s trading at about the midpoint of that range. Brookfield Infrastructure is one of the best utilities you can invest in. The stock has greatly outperformed the market and its industry over the long haul. BIP.UN data by YCharts. Price returns of BIP.UN and its peers over a 10-year period. Brookfield Infrastructure’s portfolio of long-life, cash-cow assets can be found in North and South America, Europe, and Asia Pacific. Its portfolio is very diversified and comprised of utility operations, rail operations, toll roads, ports, natural gas pipelines and storage, and more. I believe the stock is taking a breather by consolidating after the strong performance — a climb of about 52% — from 2016 to mid-2017. Currently, Brookfield Infrastructure offers a juicy cash distribution yield of 4.7%. In the new year, unitholders can look forward to a cash distribution increase of 5-9%, which would imply a forward yield of +5%. By investing in Scotiabank and Brookfield Infrastructure in your TFSA today, you should be able to generate long-term total returns of +10%. In the meantime, you’ll earn tax-free income from the growing dividends. In fact, if you hold the stocks long enough, you will be able to generate returns (i.e., a yield on cost) of +10% on the dividends alone.